I’ve been following Chris Joseph‘s work as a net artist since the late 1990’s when he was living in Montréal–he’s a Brit/Canadian living now in London. He was on Webartery, a listserv I started in 1997; there was great discussion and activity in net art on Webartery, and Chris was an important part of it then, too. I visit his page of links to his art and writing several times a year to see what he’s up to. I recently wrote a review of Sprinkled Speech, an interactive poem of Chris’s, the text of which is by our late mutual friend Randy Adams. More recently–like yesterday–I visited #RiseTogether, shown below, which I’d somehow missed before. This is a 2014 piece by Chris. We see a map, the #RiseTogether hash tag, a red line and a short text describing issues, problems, possibilities, groups, etc. Every few seconds, the screen refreshes with a new map, red line, and description. I see you're using Google maps. What's with the red line? 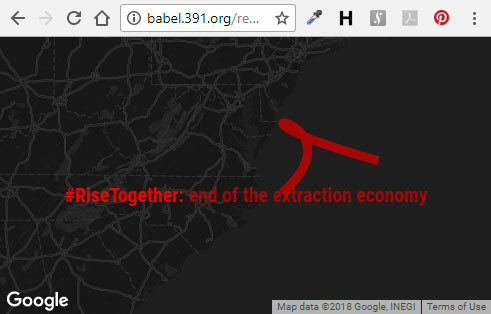 The language after "#RiseTogether"--where does that come from? Originally this phrase, as a hashtag, was used by the Occupy Wall Street anti-capitalism movement, but I think since then it has been adopted/co-opted by many other movements including (US) football teams. The starting article and the text source for this piece was http://occupywallstreet.net/story/what-way-forward-popular-movement-2014 . The red line was for a few reasons, I think. Firstly to add some visual interest, and additional randomisation, into what would be be a fairly static looking piece otherwise. But I find the minimalism of a line quite interesting, as the viewer is asked to actively interpret the meaning of that line. For me it's a dividing line - between haves and have nots, or the 1% and 99%, or any of those binary divisions that the protesters tend to use. Or it could suggest a crossing out - perhaps (positively) of a defunct economic philosophy, or (negatively) of the opportunities of a geographical area as a result of that economic philosophy. All three of those pieces have a monochromatic base, but only two have the red, which feels quite angry, or reminiscent of blood, of which there was quite a bit in the anti-capitalist protests. I used the same technique again in this piece: http://babel.391.org/remix_runran/2015/plague-vectors.html - but here the lines are much more descriptive, as an indication of the supposed 'plague vectors'. Dreaming Methods Labs http://labs.dreamingmethods.com/ features 6 leading-edge digital fiction works developed using a spectrum of technologies and in collaboration with some fantastic writers/artists including Kate Pullinger, Chris Joseph, Jim Andrews, Judi Alston, Martyn Bedford, Lynda Williams, Matt Wright, Jacob Welby and Mez Breeze. 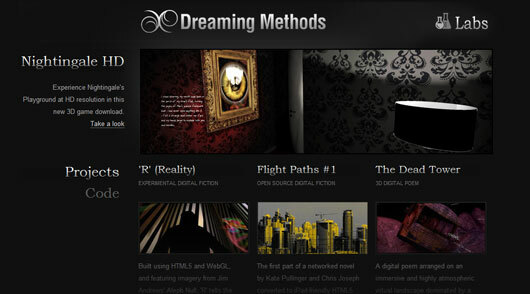 The site also offers completely free source code for developing your own digital fiction works and links to highly recommended resources across the web.